Achill Island is located on the west coast of County Mayo, Ireland. It is less than four hours drive from Dublin and Shannon International Airports and is accessible via a road bridge, linking the island to the mainland. 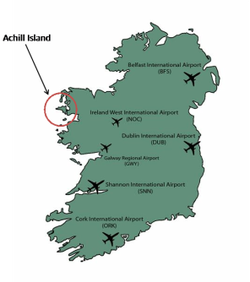 For European and UK visitors, Ireland West Airport Knock is only a 75 minute drive to Achill Island and offers regular flights to and from many UK and European cities including London, Liverpool, Manchester, Edinburgh, Barcelona, Milan, Dusseldorf and many more. Irish Rail and Bus Eireann offer daily services from Dublin and locations around Ireland to Castlebar and Westport. A connecting bus to Achill Island leaves Ireland West Airport Knock, Castlebar and Westport daily. From Dublin Airport, take M50 Southbound to Junction 8, Galway, and Sligo; take M4 onto Mullingar Bypass (N4) onto Longford. 3 km after Topaz garage, turn right (signposted Doogort).